Do not plant in the heat of the day, late afternoon is best. The more water you give to the sapling the better. Handle saplings with care, it is important to ensure the roots are kept intact and that the young bark is not damaged. Any damage can result in disease. Do not remove trees from planting bags or containers until the pit is prepared. If the soil is very hard, water can be used to loosen the ground before digging. The pit should be 1.5 times as deep as the root ball and 3 times as wide. This will give the roots enough room to grow without stress. Try to dig the hole with a small "pedestal" of dirt in the centre of the hole where the tree will rest. This pedestal prevents the root ball from sitting continuously in water. Any excess water will naturally flow to the deeper areas of the hole around the edges where the roots can drink from if needed. In the bottom of the pit, put a few inches (less than one third of the total depth) of biomass such as dried leaves, dry cow manure (not fresh) and some green biomass. Cover the organic matter with soil. For citrus trees and bamboo, do not put the manure in the hole but on top, under the mulch. Fill the hole with water and water the tree (still in its bag) at the same time. We do not want to over-fertilise new saplings with too much manure as this prevents them from gaining resilience and strength in the initial stages of growth. One handful of neem cake can also be added to each pit (along with the biomass) to improve plant immunity and give protection from pests. Around the pit make a shallow trench or a boomerang to collect water. Take a look and see if there are any natural water channels (small ones) near by, little bundhs made by hand or just with your foot can direct this water towards your saplings. The pit should be re-filled with enough biomass and soil to allow the top soil layer of the sapling (i.e. the crown of the plant - where the stem ends and roots begin) to be at ground level. We do not want to cover the crown with soil as this can result in stem rot. The plants should also not be placed below ground level (i.e. in a deep trench or pit) as high rainfall will result in flooding and damage to the crown and stem of the plant. The plant should not be in standing water for more than half an hour at a time. The roots should point downwards. Try not to handle the roots of the sapling at all when planting as they tend to be very fragile. If the planting bag is difficult to remove, use water to loosen the soil. Be patient while planting, sudden movements can result in a damaged sapling. Once the saplings has been placed, back fill with loose soil and lightly pack the soil down all around to reduce air pockets. Do this by hand, not by foot. Once the sapling has been planted, it is vital that a thick layer of mulch (dried leaves/grass/leaf cuttings/straw) be placed all around it. This will retain moisture and add nutrients. A small bundh or boomerang may have to be made to stop the mulch from blowing away. Light mulch can also be weighed down with rocks. If you have compost put 2-3 cm around the tree first and then mulch on top. Green water hyacinth can also be used as a manure under the mulch. The mulch should not come in contact with the tree trunk/stem. Excessive mulch on the trunk (especially the crown) causes moisture to build up, creating ideal conditions for insect pests, diseases, and decay. After mulching, water liberally onto the mulch. Particularly in dry climates add a bamboo watering pipe or a buried clay pot close to the stem of the plant if possible. Both approached reduce losses from surface evaporation, with the clay pot gradually watering the soil through capillary action, and the bamboo watering pipe delivering water straight to the roots where it is needed most. Keeping young trees watered is important during their first year. It’s much better to give a lot of water once a week rather than a small amount every day or two. This encourages the roots to grow down looking for water and therefore, they reach ground water much faster. The soil and mulch around your trees should be kept moist but not soggy. Avoid watering so much you see standing water. Check the soil moisture level by hand before watering, if the surface soil is moist then watering is not required. Water slowly at the drip line of the plant. Mulching is an important way of reducing irrigation, reducing evaporation, improving soil structure and fertility, preventing erosion and water runoff, and keeping roots cool. Water late in the afternoon or early in the morning. Mulching - as the mulch decomposes and is blown away, it must be replenished. As the trees grow, it might become necessary to stake them to keep them from blowing over in the wind. 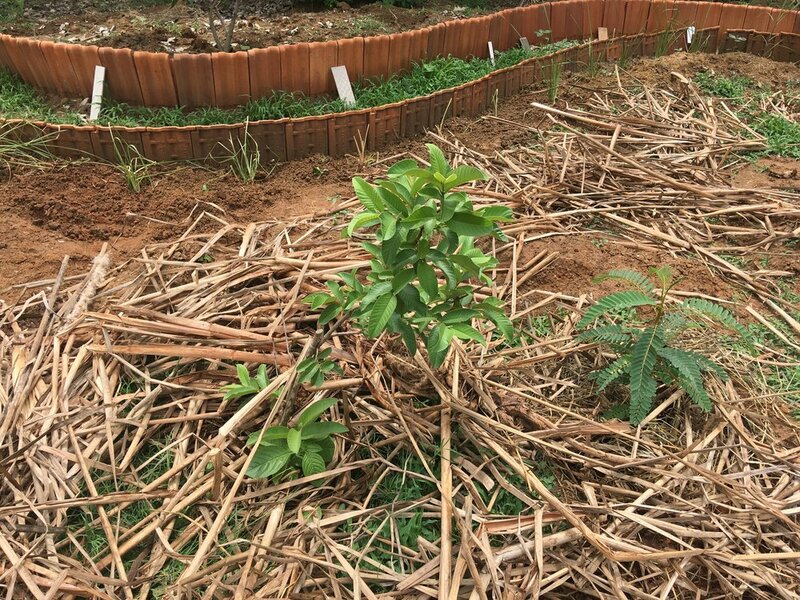 A Guava sapling mulched and planted along with a Sesbania nurse plant at our Jakkur Lake Community Garden project. A Talinum (perennial spinach) and two Bindhis planted close to a clay pot to take advantage of the moisture seeping through its sides gradually. Following the picture, the remaining bare soil was also mulched with Honge leaves.